In a large sauce pot, cook beef and sausage until brown and tender, making sure to break up with a spatula. Add herbs, garlic, peppers, tomatoes and onions and cook on medium for 30 minutes. Click on Pesto to find out how I make my Pesto….Perfect Pesto. Boil pasta according to the directions on the box. 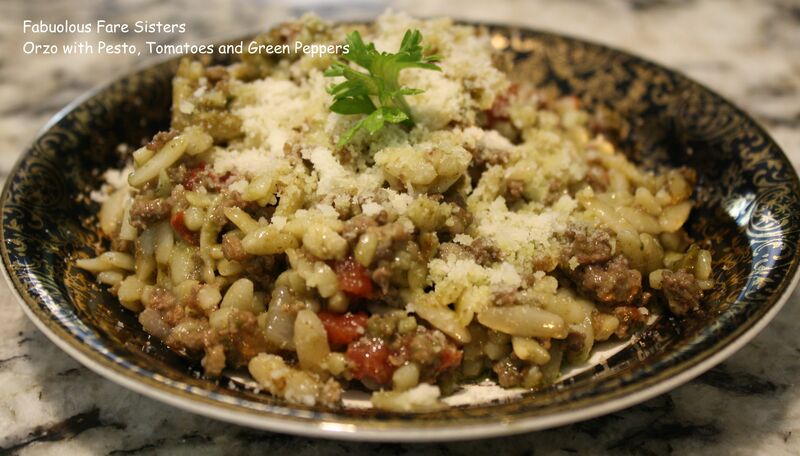 For each plate mix 1/2 cup pasta, 1/2 cup meat mixture and 2 tbs pesto. Mix together and serve with Parmesan cheese. Yummm love the flavours in this! It is good without the sausage too, but if I have it, I use it. I really like them… I was turned on to them by a good Italian friend of mine. Before that I had never had them before. Thank you… I love this time of year… I am still figuring out all the different ways I can use all the herbs i have. Pesto is the easy part. What a delicious fresh dish! You did make a lot of pesto! I usually put it in single serving freezer containers, and it’s great all winter long when summer is long gone.